Block Island, Watch Hill, Newport, Montauk, Narragansett, Cape Cod Bay and Southern Rhode Island's Premier Light Tackle & Fly Fishing Guide Service. 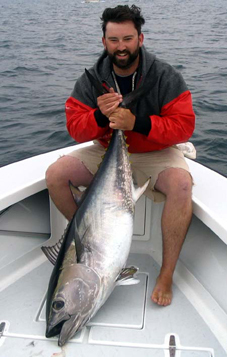 Block Island, Watch Hill, Newport, Narragansett, Cape Cod Bay, Montauk and Fishers Island Fly Fishing and Light Tackle Charter Guides in Rhode Island. RI Captains Greg Snow and John Tondra are a light tackle and Fly Fishing charter guide service on Block Island, Watch Hill, Newport, Narragansett, Cape Cod Bay, and all of coastal Rhode Island. Also Montauk Point and Fishers Island in New York. 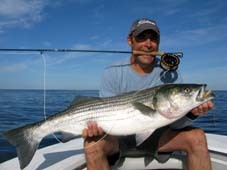 If you are looking for the finest fly and light tackle fishing in Rhode Island then look no farther. Capt. Greg Snow and Capt. John Tondra would be honored to guide you on a fishing adventure of a lifetime. Some of the most fertile and pristine coastline anywhere along the eastern seaboard consists of the islands, bays and beaches of Rhode Island. Earl with a nice Light Tackle Bluefin. Greetings! It's been way to long since our last report and for that we apologize. I'm hoping this spring has given you all a positive fish catching attitude. Lots of sunshine, warmer temps and Striped Bass have taken the place of huge snow mounds at the top of our driveways, bitter cold & ultra short days. A lot has happened with the Striped Bass fishery since then. As most of you know by now, the DEM changed the Striped Bass regulation from 2 Bass to 1 Bass per angler per day. This is really good news and a step in the right direction. Our beloved state fish has taken a real beating over the last decade both commercially and recreationally. Hopefully some day soon Striped Bass will no longer be commercially fished which will in turn allow for better regulation and an increase in the size and population of these magnificent fish. So let us enjoy this small victory for a moment but at the same time realizing that there is a long way to go to save the man in the striped suit. In the end if a commercial fishery exists for Bass then we won't be able to protect the big fish. These are the breeding females which would include just about any fish over 35 inches. These fish are ABSOLUTELY crucial for the survival of the species! These big girls are the fish that are being targeted. It's actually the recreational end of things that kills most Striped Bass. However; it's because they can be sold commercially which allows the greedy recreational fisherman (this includes many 6 pack charter boats) to sell their catch as well as their clients catch in alot of cases to restaurants and fish mongers. John and I believe that most fisherman are not aware of this fact and really have no idea of the real state of the Striped Bass. We hope that further regulations will save the Striper from a fate that is inevitable at the rate in which they are being harvested. Now lets talk about the 2015 fishing season. Capt.John will be arriving on Block Island with his 23' Jones Brothers tomorrow and I will again be trailering my 23 SeaCraft on the mainland to wherever the fish are. The water is still a frigid 53 degrees on the island but Stripers and Fluke fishing have been good at times but still inconsistent. Narragansett Bay has also given up some spectacular fishing at times but also inconsistent. No matter where in Rhode Island you're looking to get out and tight to some fish Snowfly Charters has you covered. So give us a call and lets get you on the water and create some epic fishing memories. Until next time, Screaming reels & ripping tides!